I’m pink, therefore I am? There has been something for me this Lent about becoming. About being willing to let go of what I hold precious, about being open to becoming, to understanding something of the potentiality in me, the calling to be all that God has made me to be. About the calling on not just me, but on each one of us to flourish, to discover who we are, and to continue becoming the people that we are made to be. And so this Easter, for me it is remembering that Good Friday is on the way to Easter Sunday, the light and life of God. I’ve been reminded, recalling my journey into pink in the first place, and my journey through this Lent that God never tires of embracing us, of surrounding us with his infinite mercy. He meets us in darkness and disappointment, he meets us on the journey. Today I’ve been noticing the story of Peter – Peter who denied that he even knew Jesus when he was arrested, Peter, who on that first Easter day doubts that Jesus is alive, and needs to go and see for himself, to check the story…. But Peter who is then entrusted to go out and preach, to share the good news of. It’s a story of reality, of real people. Peter who has been to that low place, of complete rejection of his close friend, the death of his close friend, and who now encounters the life, the transformation, the love, offered by his friend. For me, pink is a reminder of that life, it is a reminder that I can’t do this in my own steam, that the life we are called to is not one of ego, but of service. That we are each called to let go of those things that we hold close, the things that can get in the way of us encountering God, and reaching out to those around us. I’ve rather cheekily re-written the great Cartesian motto, but this Easter, it feels right for me to take back the pink. It is my own story of God’s transforming love, working in my darkness and disappointment. It is a visible reminder to myself to keep on becoming, to keep being open to all that I am, to all that God has made me to be, to keep letting Christ work in me and transform me. All week I’ve had great difficulty remembering what the Maundy means, in Maundy Thursday – and it’s this – it’s the new commandment that Jesus gave us – to love one another – as I have loved you, so you must love one another. So today is a day to celebrate, to be open to the beautiful future, the abundant life that Jesus offers us… to let the light of Easter break through, bringing hope and love and light to each one of us and to the whole world. My sermon on 10th April followed up reflecting on some of these themes. This has been an interesting journey through holy week this year – we’ve been in all our local primary schools exploring the holy week journey with the children. Several of the children have asked questions about Good Friday… and why is it called Good. It got me to wondering again, what does Good / Holy / Suffering / Long Friday mean, and what is its significance for me this year? We see the awfulness of human beings, the distortions of power, the need to control others that is played out in the Crucifixion. We see the fear of difference, the spread of hatred, the cycle of terror that leads to Jesus being on that cross. And yet, in that pain, we hear Jesus praying for the forgiveness of those that put him there, we hear him talking to others and still pointing the way to God’s love. We see him willing to let go, to let go of his very life here, to submit to that painful death. Through it we see something more of God, whose love goes beyond and deeper than the mess and cruelty and power-games and institutions created by humans. 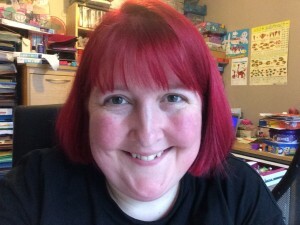 What does it mean for me, as I come towards the end of this journey through Lent without pink. 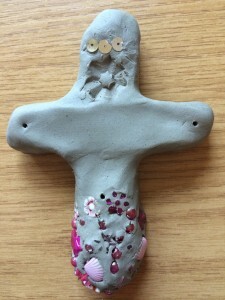 As I reflected on the cross I made this clay cross, and at the bottom I filled it with little pink bits – beads & sequins – bits to remember this journey through Lent, this offering of my identity, this letting go of what I have created of me… and the encountering again of the awesomeness of the love and mercy of God.